Watch our film, funded by the Paul Hamlyn Foundation. The annual Summer Reading Challenge is the nation's biggest reading for pleasure programme. It was launched in 1999 to encourage children aged 4 to 11 to borrow and read six library books during the long school holidays when children's reading skill and confidence can dip. There is a different theme each year and children can read whatever they like. They receive incentives for each library book they finish, and those who read at least six get a certificate or medal. 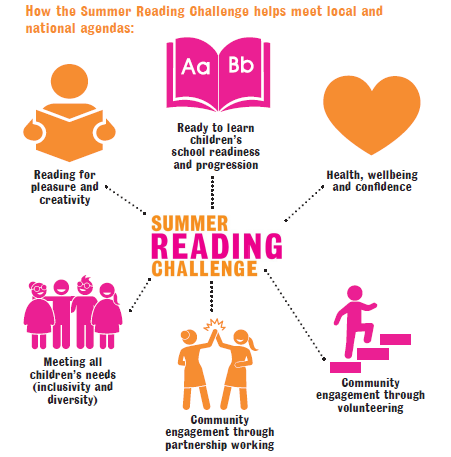 The Summer Reading Challenge Review takes place every four years to assess if the programme is still meeting the needs of its target audience, and highlights ways to improve the Challenge in the years to come. Public libraries have faced significant challenges in recent years and many services have had to adjust their activity programmes to reflect pressures on budgets and workforces - so the 2017/2018 Review was timely; it generated more than 1,000 responses which have shaped the recommendations summarised in the executive summary and It showed that the Challenge remains hugely popular with libraries, their partners and customers - all of whom have testified to the quality, reach and impact of the programme. The Challenge itself is undertaken by the vast majority of UK library authorities (currently 96%) offer the Challenge, and around 700,000 children take part every year - 45% of them boys. In recent years, pre-school children have joined in - and increasing numbers of teenagers and young adults have volunteered to help. Read the full Summer Reading Challenge 2018 review. Read our family survey to know what parents had to say about the 2018 Challenge. Read the executive summary of the Summer Reading Challenge 2018 review. Find out more about the impact of reading on our reading facts page.